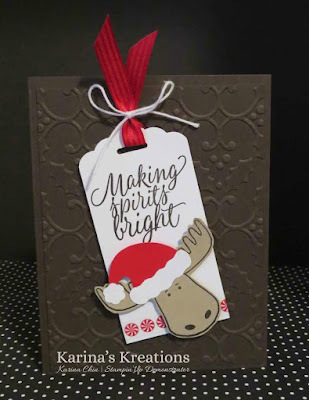 Karina's Kreations: Stampin'Up Jolly Friends! We're making this cute card at my class Wednesday morning. This card uses the Jolly Friends stamp set and Jolly Friends Hat Builder Punch. You can buy these as a bundle and save 10%. This is the bundle ordering number 143511. I used the Holly Embossing Folder #141634, the scalloped tag topper punch #133324, Candy Cane Lane Washi Tape #141985, Whisper White Baker's Twine #124262 and Real Red 3/8" Stitched ribbon #141693.